That’s a wrap, folks — the 2016 Olympics games in Rio are over. The closing ceremony took place on Sunday night, and it had plenty of memorable moments — most notably, the wacky teaser trailer for the 2020 games that played at the end. However, there was another moment during the closing that was much more subtle but perhaps even more notable: Eliud Kipchoge’s reaction to the national anthem playing during his gold ceremony. Kipchoge came in first in the men’s marathon the day before, taking home his first-ever Olympics gold medal, and the Olympics honored him and the other medalists during the closing ceremony of the games. Kipchoge is from Kenya, and as he was basking in the glory of his win, the Kenyan national anthem played in the arena. There were surely plenty of people in the stadium that didn’t recognize it as such — but Kipchoge sure did. For some context, the Rio games were the most successful Olympics Kenya has ever participated in; the country took home six gold and six silver medals, more than at any other Olympics. 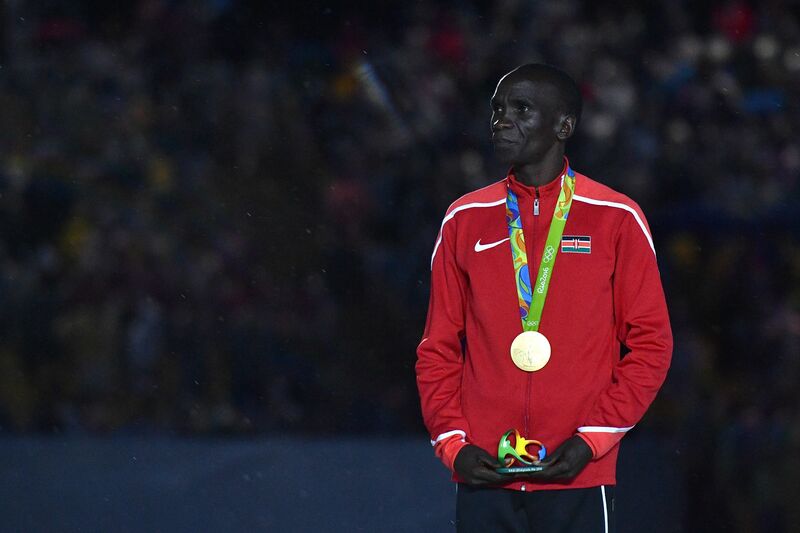 When the country’s national anthem played during the closing ceremony, Kipchoge visibly reacted in a manner that was understated and somewhat guarded, yet powerful and touching at the same time. Only he knows precisely what was going through his head at the time, but there’s something mesmerizing about the manner in which he took in the gravity of the event. Check out the look on his face as his country’s anthem played at Rio — and take special note of the moment when the anthem finishes, and his expression switches from quiet contemplation to sheer, unadulterated joy. Considering Kipchoge has won six of his last seven marathons, it wasn’t a surprise to see him win the gold in Rio. He finished the 26.2-mile race in two hours, eight minutes and 44 seconds; the silver medalist, Ethiopia’s Feyisa Lilesa, finished just over a minute later. The United States' Galen Rupp took home the bronze medal, and thus became just the third American since 1924 to medal in an Olympic marathon. His expression that night proved how meaningful the win really was.